The cutting shown below was sent by Jane Brooks, and we are grateful to her for allowing us to use it. Tatham History Society would be pleased to receive any further information about the poem (especially the publication and date) or author. Click here to contact the Society. I passed at Tatham Fells. In youth at Tatham Fells. By far than Tatham Fells. For you and Tatham Fells. Your hearts at Tatham Fells. To you and Tatham Fells. For me at Tatham Fells. Arthur Iveson Capstick born 6th June 1848 in Tatham Fells. 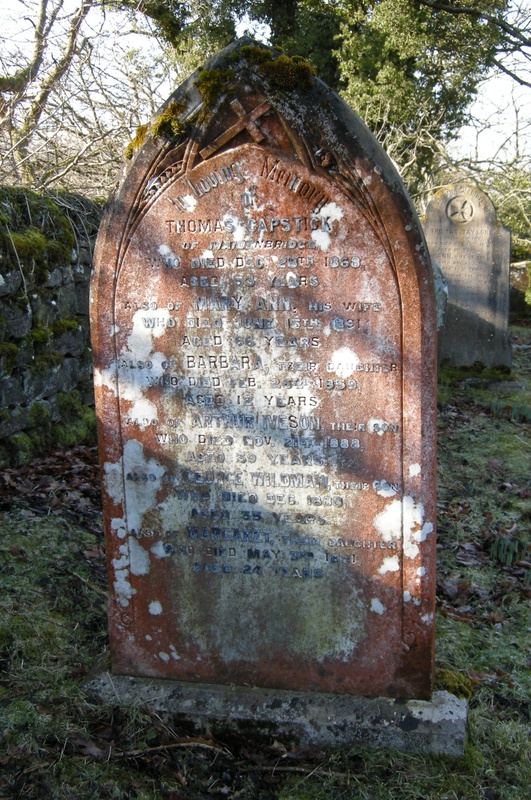 Son of Thomas and Mary Anne Capstick of Maiden Bridge. At Maiden Bridge in census for 1851, 1861 (Scholar), 1871 (Ag Labourer). St. Chad's church Rochdale parish register, 13th September 1875. Arthur Capstick, aged 27, bachelor, butcher of Milkstone Road, Rochdale. Elizabeth Webster, aged 25, spinster, of Sudden, Rochdale. 1881 census. Butcher's shop, 260 Manchester Road, Castleton, Rochdale. Arthur, head, butcher, age 32, born Tatham. Elizabeth, wife, age 31, born Bentham, Y. Son (Thomas Arthur Capstick) born Rochdale 1884. Arthur Iveson Capstick died in Rochdale on 21st November 1888. Memorial in Tatham Fells churchyard on his parents' gravestone. His widow remarried Dec. qtr. 1889 in Rochdale to Alexander Peat.